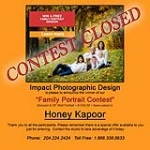 Posts with tag: "Couple Portraits"
Congratulations to the winner of our Family Portrait Contest! Also a big thank-you to the hundreds of people who entered. Please remember that as a thank-you just for entering you received a special promotion that can save you hundreds on your family portraits. Don't delay. Contact the studio to start the process of having us create outstanding memories for your family today! If you would like to be kept up-to-date of the latest goings on at Impact Photographic Design and be advised of future contest, please signup for our monthly newsletter HERE.